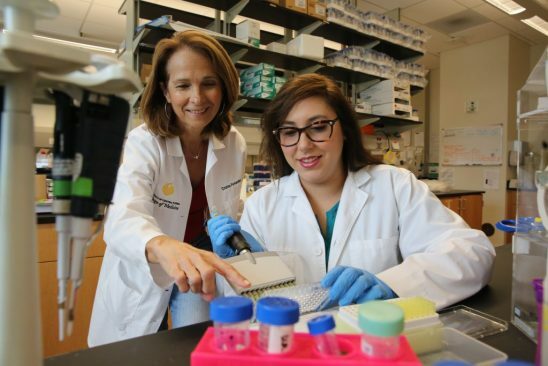 “Live Like Bella,” a new Florida Department of Health pediatric cancer initiative, is bolstering efforts of a College of Medicine researcher who is seeking treatments for a debilitating childhood tumor disorder. Dr. Cristina Fernandez-Valle received a $200,000 grant for her research into Neurofibromatosis type II, a genetic condition that causes tumors to grow in the brain and along the spine and nerves. The funds were made possible from the Live Like Bella® Childhood Cancer Foundation created in memory of Bella Rodriguez-Torres. At 10, the Miami girl succumbed to stage four alveolar rhabdomyosarcoma, an aggressive childhood cancer. The foundation has made possible 17 research trials and assisted families in 47 states and 13 countries. Neurofibromatosis is a group of three genetically distinct disorders that causes tumors to grow in the nervous system. Fernandez-Valle researches Type II or NF-2, which affects 1 in 33,000 people. People usually begin getting the tumors in childhood. Currently, there are no approved drug treatments for NF-2. Patients usually undergo surgery to remove tumors, but that’s risky because the tumors are in such delicate locations. Tumors typically grow on both nerves that control hearing and balance so surgical removal often results in hearing loss and facial paralysis. Radiation therapy is also used but that too can cause hearing loss, and in some cases, worsens the condition. 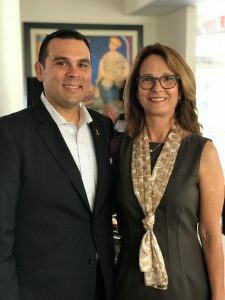 Fernandez-Valle is part of a consortium of scientists called Synodos NF-2 who are conducting collaborative research to identify drug therapies. Her work has been funded by the Children’s Tumor Foundation, the U.S. Department of Defense, and the National Institutes of Health. Creating a new drug to treat the disease would take decades. So the team is examining whether current FDA-approved drugs to treat cancer can reduce tumors in NF-2 patients, even though their tumors are benign. “Hopefully, that’s a much faster route to clinical trials,” she said. Fernandez-Valle says data from previous research suggests that a combination of two FDA-approved drugs might slow the growth of NF-2 tumors or kill them. Funds from the Live Like Bella Initiative will continue the next phase of drug screening which will be done in a partnership with Drs. Amy Smith and Ana Aguilar-Bonilla, pediatric neuro-oncologists at Orlando Health’s Arnold Palmer Hospital for Children.